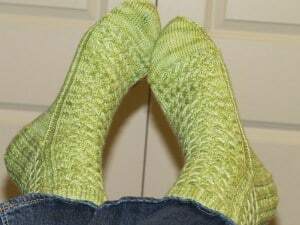 I thought the second appley sock was going to be boring after that first hiccup, but at some point, I lost track of where I was in the chart and all of a sudden, I had an extra row of zigs where there should have been zags. Not to worry, I ripped a couple of rows and all was right with the world again. I must confess that I love these little socks. I don’t know if it was the yummy yarn or the smooth pattern or that people far and wide have been admiring them or fond thoughts of the person they’re going to live with, but even with the rough patches, I really enjoyed knitting these lovelies. I felt like a process knitter for once in my life. Needles: 2.5mm for the leg, 2.25mm for the foot. Pair 12 in my 100 sock journey. 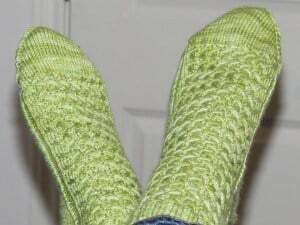 Katherine the Great » Blog Archiv » Slaying the Dragon’s Breath socks. What great socks! I’m totally digging this bright green color lately. Alicia recently posted..WIPWed #30: Why, hello there! They are done! Yay! What a wonderful job. Nice socks! Lovely colour too! Sam recently posted..Fo Friday – chunky hat! I love those socks too. Now I think I’d better add that pattern to my queue as well .. before I succumb to sock envy! They do look rather scrummy. I love the pictures people take of their own feet in sock. The colour of those socks is delicious! I like the cute shorter length of them as well. Great job! I love your socks! The color and pattern are both so beautiful! Beautiful socks, but aren’t apples red? ;-) At least the ones I picked yesterday are. hands down…(feet down??) my favorite color lately!!! (i’m fickled—i switch around favorite colors all the time, but for now—-limey apple green is it!!!) love the pattern, too! steph recently posted..There are probably some things I shouldn’t confess to….but what the heck! Those are GORGEOUS. I love love love the color! Nicely done! ooooh, I love these socks! The yarn color is a perfect choice too.